New by Peach Couture (a registered trademark). 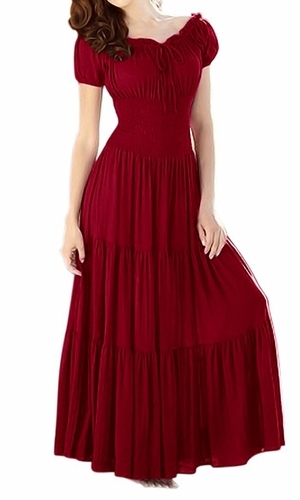 This smocked maxi peasant dress is a very trendy boho gypsy look. Take a stroll out on the town with this casual day dress or pair with heels and accessories for a more formal occasion. The dress is a lightweight and soft material to keep you comfortable all day long. The top features a self-tie neckline with ruffled short sleeves. A smocked waistline creates the perfect fit, which leads into a beautiful tent maxi bottom. Warm enough to wear with boots and a sweater for that perfect fall look. Made my Peach Couture (A registered trademark). Colors Available: Maroon, Blue, Brown, Purple, Black. Material: 92% Polyester 8% Spandex. Fits Approximately Dresses Sizes: Small US: 2-4 UK: 4-8 EU: 32-34 Length: 54" (137 cm), Bust: 32" (94 cm), Waist: 20" (51 cm), Hips: 40" (102 cm). Medium: US: 6 UK: 10 EU: 36 Length: 54" (137 cm), Bust: 35" (89 cm), Waist: 22"(56 cm), Hips: 41" (104 cm). Large US: 8 UK: 12 EU: 38 Length: 54" (137 cm), Bust: 36" (91 cm), Waist: 24" (61 cm), Hips: 42" (107 cm). XL US: 10 UK: 14 EU: 40 Length: 54" (137 cm), Bust: 37" (94 cm), Waist: 28" (71 cm), Hips: 44" (112 cm). Machine wash cold separately or with like colors. Gentle cycle non-chlorine. Tumble dry low. Cool Iron.